All tracks recorded 1965 at Audio Tonstudio in Berlin (Ostpreussendamm). In the years 1963-71 the Manfred Burzlaff Quartet played daily at the "Old Eden Saloon", located at Damaschkestrasse in the Berlin district of Charlottenburg. Even today, the old Berlin jazz fans not only rave about this band, but also about the unique "beer monorail", that delivered drinks directly to the tables. Many of these tables were exclusively reserved for American and British guests. The "jazz room" in the "Old Eden Saloon" had the size of a normal living room. As a home of jazz music, however, the room was internationally known and visited often and regularly by jazz musicians and jazz fans. Manfred Burzlaff not only played the vibraphone here and arranged, but also booked the musical guests and had his own key to the room. Bob Degen (piano), Michael Dennert (drums) and Michael Bahner (bass), who were later replaced by Hartwig Bartz and Harry Rettenbacher, played in Burzlaff`s “house band”. His friend Heinz von Moisy had brought Bob Degen into the band, who previously worked as a lecturer in Boston. Internationally acclaimed soloists performed with the band at approximately monthly intervals, among them Albert Mangelsdorff, Don Byas, Dexter Gordon, Pony Poindexter, Art Farmer and many others. 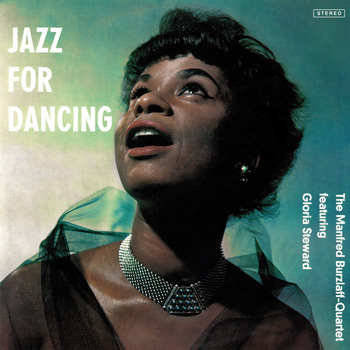 The American singer Gloria Steward joined in 1965 and performed daily with the Burzlaff Quartet from ten o`clock in the evening until three o`clock in the morning. The club remained close at Christmas Eves only. Occasionally the "Old Eden" also served as a film set. For example, scenes of the Edgar Wallace adaptation “Das 7. Opfer” ("The 7th Victim") were shot with the Burzlaff band in the background of the "jazz room". 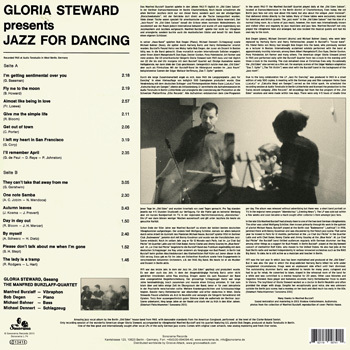 Due to the long collaboration the LP "Jazz For Dancing" was produced in 1965 in a small edition of only 500 copies. A meeting with the German pop and film composer Heino Gaze ("LaLeLu" or "Calcutta iliegt am Ganges") served as the initial spark. He scheduled the recording session at Audio Tonstudio in Berlin-Lichterfelde and licensed the production to the Swiss record company "Elite Records". All recordings hail from the live program of the "Old Eden" sessions and were made within two days. There were only 4-5 hours of studio time per day. The album was released without advertising but there was a short band portrait on TV, in the regional news program “Abendschau” ("Evening News"). The LP was sold out within a few weeks and soon became a much sought after collector`s item amongst jazz fans. In the late 50s Manfred Burzlaff had already risen to one of the two best German vibraphonists. The other was called Wolfgang Schlüter, then known primarily through his work in the quintet of pianist Michael Naura. Burzlaff played at the Berlin club “Badewanne” ("bathtub") in 1958, jammed there with Benny Goodman and was discovered by the French jazz scene. That same year he moved to Paris for 12 months, performed at the "Le Chat Qui Pêche" in the Quartier Latin and with Chet Baker, Kenny Clarke and Jimmy Gourley at the "Blue Note". At "Le Chat Qui Pêche" the Burzlaff band thrilled audiences regularly with German drummer Joe Nay, among other things as a support for Bud Powell. In Berlin Burzlaff played at the big farewell concert of clarinettist Rolf Kühn, who moved to the United States. He also had jobs at the East Berlin radio and worked independently in various renowned orchestras such as the RIAS Big Band. To date, he is still active as a musician and teacher in Berlin. 1971 was the last year in which Jazz has been maintained and produced at the "Old Eden". But it was also the year in which the drug-addicted Hartwig Bartz killed his wife under unexplained circumstances. Drugs were an unpleasant side effect until their dismissal. The outstanding drummer Bartz was addicted to heroin for many years, collapsed and had to go for rehab. He converted to Islam, stayed in the rehearsal room of the band for a while and was commited to a mental hospital for 20 years. Other case histories and tragedies followed. Bass player and homeless alcoholic Harry Rettenbacher froze to death in Vienna. The boyfriend of Gloria Steward worked as a doctor in Berlin-Neukölln and often provided the singer with drugs. Despite her exceptionally good voice, she was unknown outside the Berlin jazz scene, had a monkey on her back and died much too early in the 80s. Many thanks to Manfred Burzlaff.